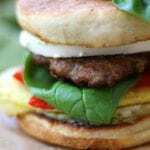 A savory, flavor packed breakfast sandwich. For the Pesto Mayo- Mix together pesto and mayonnaise. Store in an air tight container. For the Sandwich - Measure 1/4 cup of meat for each patty from Homemade Italian Sausage recipe (see link above) and form all patties. Preheat a large frying over med/high heat and fry sausage patties for 5-7 minutes per side or until well browned and reaches an internal temperature of 160℉. Transfer patties to paper towel lined plate to drain excess grease. Working with 1 egg at a time, break egg into bowl and whisk with 1 tsp cream, salt and pepper. Spray a small frying pan with non-stick cooking spray and place over med/high medium heat. Add egg, swirl pan to evenly distribute egg and let cook for 1-2 mins or until sides of egg begin to firm and egg is no longer runny. Gently flip with spatula and cook for 1 additional min. While egg is cooking toast English muffin to desired doneness. Apply mayo, egg, sausage, cheese and veggies.